From Siberia to the Bolshoi, Russia to Dutch National Ballet and on stage with her partner, Matthew Golding, with The Royal Ballet. 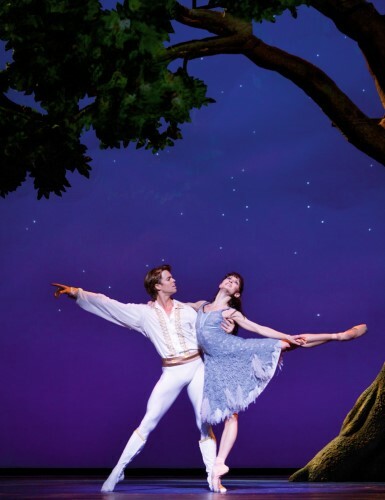 Dutch National Ballet brings Sadler’s Wells Associate Artist Christopher Wheeldon’s spectacular new Cinderella to London’s Coliseum. This magical fairy tale has been reimagined by Wheeldon, who has cast Cinderella as a kind hearted heroine and her Prince conflicted and struggling against his royal duties. 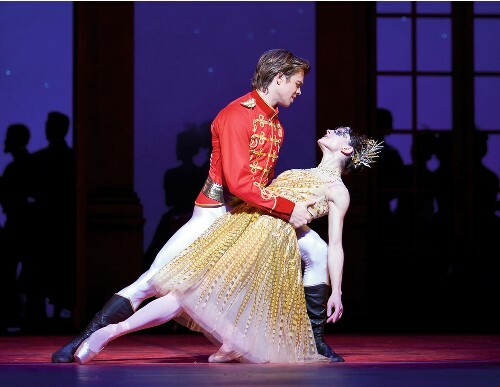 Wheeldon created his Cinderella on his ‘muse’, Russian ballerina Anna Tsygankova, Principal with the Dutch National Ballet, Guest Artist with The Royal Ballet, who will be dancing the title role in London. Anna will be joined by her partner, Canadian dancer and Guest Principal with the Dutch National Ballet and Principal with The Royal Ballet, Matthew Golding as her Prince. Anna shares her journey from Siberia to the Bolshoi, from Russia to the Dutch National Ballet, working with Wheeldon in the studio and dancing on stage with The Royal Ballet. 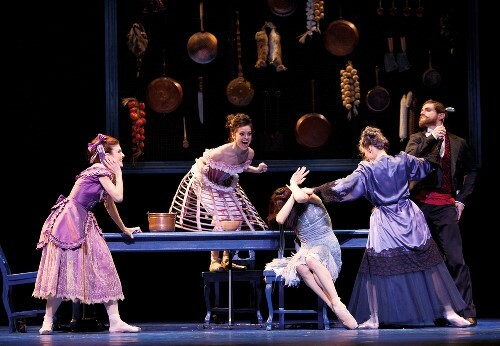 Wheeldon has called you his ‘muse’ having choreographed Cinderella on you. Can you tell us about the creative process and your experience of working with Wheeldon? I was thrilled that Chris chose me to be his Cinderella. My first time working with him was in San Francisco, where he started the creation. I immediately fell in love with his unique language and his vision. Dancing Chris’ ballets makes me feel so free, happy and harmonious. He is amazing to work with in the studio, he creates really fast, he is very clear in what he wants and he takes the best of you and highlights it. With Cinderella, Chris paid so much attention to the smallest details, pantomimes, literally giving us the text of what we are acting, so on stage it looks like everything is happening right there for the first time. I think structure is really important for Chris, the way the story flows and he knows exactly how to keep the balance of the show. Beautiful dancing scenes, the monologues of the heroines and the pantomimes are put in perfect order, there is always place for a lot of humour and beautiful visual effects so every moment of the ballet, the audience is kept at the edge of their seats. Wheeldon’s Cinderella is a kind-hearted heroine making the best of life without her beloved mother, she is prideful but also a little feisty. How did you approach the role, what preparation did you do to become Cinderella? The way Chris sees Cinderella is really close to how I see myself. I listened carefully to everything Chris was saying about the role. As well the steps also helped me to understand Cinderella’s character better. So I guess it worked both ways. Oh yeah, and I like to clean [laughs]. As Cinderella you will be dancing with your partner Matthew Golding as your Prince Guillaume, how does this influence your performance? Chris’ style of partnering is very challenging for the men. In order to make everything look flawless, the partner should have great skills and technique, and the ballerina must have total trust for her partner. My partnership with Matthew has developed over the passed six years ago, and during that time we have also developed as individual dancers. The fact that we are partners on and off stage creates a certain intimacy in how our characters interact and when we express our love for one another comes from the heart. This year you’ve joined as a Guest Artist of The Royal Ballet, can you tell us about your experience working with company? It was an unforgettable experience. The stage felt incredible, the company and staff were so warm and helpful, it was great to feel their support. The Royal Ballet is an amazing company with a long impressive history, strong traditions and they are all great professionals. It is always special to be in this kind of environment. As a world renowned ballerina you’ve danced all the lead roles, do you have a favourite role and why? Maybe you should ask what is not my favourite role! I love them all! I cannot say I love Kitri more than Giselle or Marguerite more than Tatjana. There are all part of me and they deeply influenced my life. What has been your greatest challenge as a dancer? There were many different challenges. The challenge of working on a new creation or a challenge to dance the ballet for the first time or fly ten hours and go on stage. But the latest one was to learn Don Quixote by Carlos Acosta in three days while guesting in Vienna, fly into London on the first day of New year and go on the Royal Opera House stage to be partnered by Matthew. Wonderful experience, challenge and adventure. What is the most fulfilling aspect of being a professional dancer? It is being professional. To know deeply what you are doing, to dance on the best stages in the world, to meet the most interesting and influential people of our profession; it is a great life to be a professional dancer. As a young girl growing up in Siberia, what drew you to ballet and how old were when you knew you wanted to become a ballerina? I was born into family of musicians, growing up in the conservatorium where my young parents studied piano. I was four years old when my mother started teaching me to play this wonderful instrument. But ever since I can remember, I always wanted to dance. I loved theatre and I imagined myself dancing on stage; my parents and their friends were my first audience at the house concerts, which I loved to organise since I was young. After training in your home country and with the Académie de Danse Princesse Grace in Monte Carlo, you joined the Bolshoi as the first dancer not to have come from their prestigious ballet school. What was your experience of dancing with the infamous Bolshoi Ballet? I was seventeen, it was scary in a way to leave home and my family whom I was and am deeply connected with. But my experience of working in the company (my last year of ballet school, I was invited to dance with Siberian State Ballet as Principal Ballerina) helped me to overcome the fear. Before I joined the Bolshoi Ballet, I had already danced Swan Lake, La Bayadere and toured with Siberian State Ballet. Bolshoi gave me the most amazing coach a ballerina could wish for. For six years, the ballet legend Raisa Struchkova coached me and was also my mentor at the University. I watched so many shows danced by the most amazing dancers, I learned so much and I feel blessed to have had that experience. You then danced with the Hungarian National Ballet and Wiener Staatsballett before joining the Dutch National Ballet in 2007. How different is it dancing in Russia, Europe and now in the UK? Hungarian people are incredibly warm, I spent three years dancing in an amazing theatre, learned a lot of new repertoire, as well as the language and Hungarian culture. There is a difference in the mentality of Russians and Hungarians, but still not as apparent as between Russians and Dutch. So the biggest switch for me was the mentality. Dancing in Europe opened up my mind, introduced me to the world of contemporary ballet and gave me the opportunity to work with the most fascinating choreographers. The Dutch National Ballet is a world acclaimed ballet company, what do you feel makes the company unique? I think it is the combination of dancers with a lot of different skills. The majority of the company is quite young, so there is a lot of drive. Some of the dancers are more experienced then the others but definitely everyone of them had strong ballet training before joining the Dutch National Ballet. Also, the dancers are very creative and many of them who have started to choreograph have become known young choreographers and are invited to choreograph at different places. The repertoire of the company includes all the classical heritage, the best of Balanchine, the great Hans van Manen, who is still full of energy and keeps on choreographing and every year there are new works to expand the range of the repertoire. All together, this makes the company very versatile and keep the dancers challenged. As an inspiration for many aspiration young dancers across the world, what advice would you give them? Know and feel your goals. Avoid jealousy and comparison, cherish your unique skills and don’t stop learning. And finally, what pointe shoes do you wear?